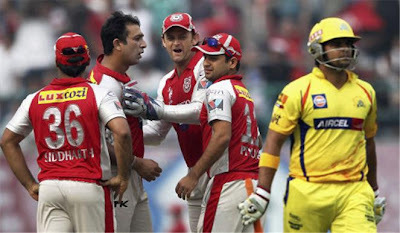 Tomorrow On Wednesday 13th April 2011 Two Matches of Indian Premier League are going to take place. In first match Kings 11 Punjab will be facing Chennai Super Kings in Mohali Stadium. Chennai is a better team than Punjab so it will not easy Punjab to win this match. In Second match of tomorrow two new IPL teams Pune Warriors India will be facing Kochi Tuskers Kerala in Mumbai. Pune won its first match against Kings 11 Punjab while Kochi lost its first match to Royal Challengers Bangalore.